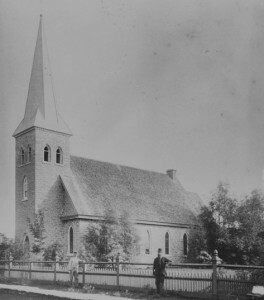 Built in 1823, St. John’s was not only the first church in the village but also in all Carleton County. The original log building was replaced by the present limestone structure in 1860. Throughout the nineteenth century, the congregation had strong ties with the political and economic elites of the community and their fraternal societies, the Masonic & Orange Lodges. A famous parishioner, Maria Hill Taylor, donated the church spire and its renowned ministers the Rev. 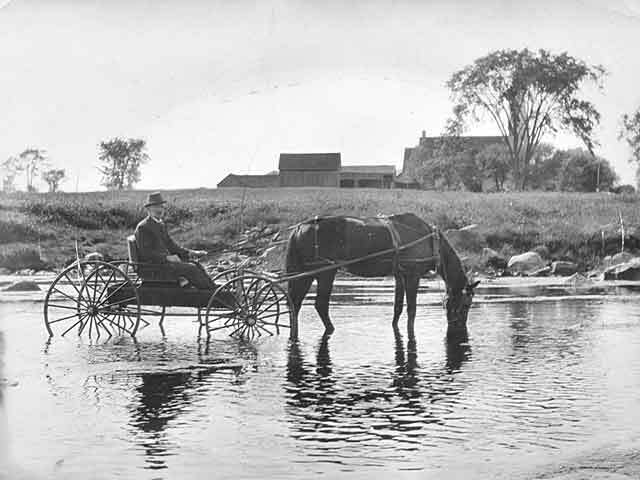 John Flood and the Rev C. B. Pettit were instrumental in the development of both the Anglican church and education in Carleton County. Soon after the arrival of the first soldier-settlers to Richmond, in 1818, St. John’s began providing a spiritual haven and a social focus for Anglicans in the village and surrounding area. Early services were held in the school house, but Anglicans quickly organized the building of their own church. The corner stone of the wooden church was laid by local Masons on St. John the Baptist Day in 1823. In 1858, it was decided to replace the existing structure with a new stone church. Its corner stone was laid in 1860 by the Sovereign Grand Master of the L.O.L of British North America. In the 1830’s the rector of St. John’s was responsible for a vast territory: all of Goulbourn Township, much of Nepean and Marlborough reaching east to Long Island on the Rideau. The 1851 census shows that more than fifty per cent of the village population considered itself Anglican. An examination of the “List of Subscribers” to the new church in 1860, reveals the influence of the congregation not only in Richmond but also Bytown and the County. The largest contributor, Mrs. Henrietta Lauder, was the daughter of Capt. John Bower Lewis, a member of the 88th Connaught Rifles, merchant, Justice of the Peace and member of the Legislative Assembly of Upper Canada. Her brother, John Bower Lewis was the first mayor of Ottawa and an M.P. Mrs. Lauder’s first husband, William R. R. Lyon, was the son of Captain George Lyon, and her second husband, the Rev. John Strutt Lauder, rector of Christ Church, Ottawa. The second largest contributor, Edward Malloch, was in fact a Presbyterian, but was married to Margaret, the daughter of Andrew and Maria Hill, who herself, donated money for the church spire. Other prominent villagers who contributed were the Torney family and Jos. Hinton, Reeve of Richmond and Warden of Carleton County (Hintonburg is named after his family). An examination of the activities of two pastors shows the dominant role this parish played in mid-nineteenth century community life. Rev. John Flood, rector from 1841-54, was a superintendent of schools and instrumental in the formation of the Richmond Grammar School, the first in Carleton County. Rev. Charles Biggar Pettit was the rector from 1855 until 1877. 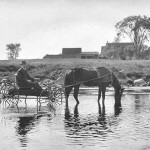 He also looked after the parish of Bell’s Corners and commuted weekly on horseback carrying a portable organ. He became the principal of a church sponsored grammar school there. Rev. Pettit and Mr. Hinton were the key leaders of the Richmond Circuit Board of Public Instruction which was responsible for the certification of teachers and the operation of schools. St John’s also had a strong connection with the military. In 1862, a volunteer company of 50 men drilled in the old church for two years. From its earliest beginnings, throughout the nineteenth century and early twentieth century St. John’s continued to have a strong connection with the local political and economic elite and also continued to serve the religious, social and cultural needs of the Anglican community. The first rectory, according to the 1851 Census, was one of only three stone buildings in the village. It was destroyed by fire in 1871. 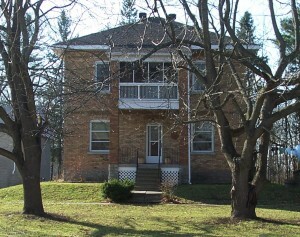 The second rectory, a”rambling” house, was made of brick and the front facade was dominated by large verandas. In 1922, it was decided to demolish the second rectory and replace it with the present building seen at the left. The church has changed little over time. Constructed of quarried stone, it has a simple symmetrical façade (Georgian) with the door in a projecting tower below the spire. It has certain Gothic elements such as a steep pitched gabled roof and pointed arch windows. The spire and stained glass windows were added several years after 1860. The picture to the right shows sheds in the rear of the church which were used to protect horses & carriages during services. These were removed many decades ago. Cathcart, Percy et al. Goulbourn Memories. Ottawa: Goulbourn Township Historical Society, 1996. Jefferson, Robert & Leonard Johnson. Faith of Our Fathers. Ottawa: The Anglican Book Society, 1957. Kalman, Harold. A History of Canadian Architecture. Vol.1. Don Mills: Oxford University Press, 1994. McCoy, Mildred et al. 160th Anniversary of St. John’s Anglican Church, June 24th,1983. Richmond:St. John’s Anglican Church, 1983.